To celebrate the eighth and final season of Game of Thrones®, DIAGEO and HBO have released the limited-edition Game of Thrones Single Malt Scotch Whisky Collection in Australia. 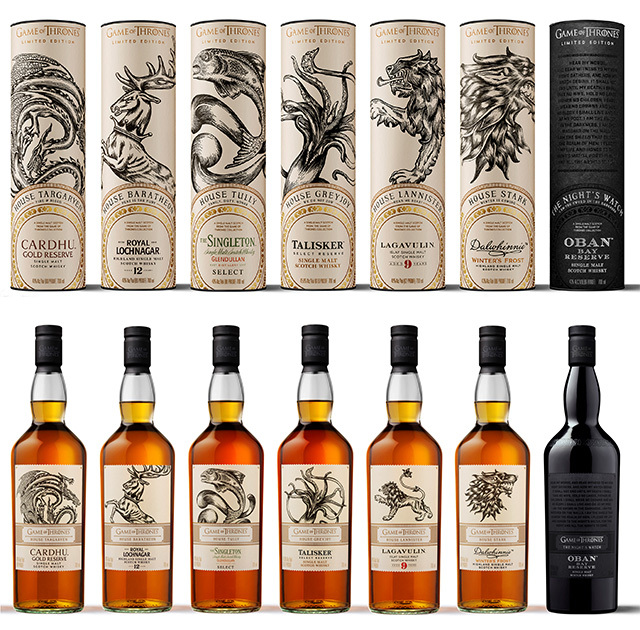 The Collection features seven Scotch whiskies paired with six of the iconic Houses of Westeros, as well as the Night's Watch, giving fans an authentic taste of the Seven Kingdoms. The Game of Thrones Single Malt Scotch Whisky Collection is joined by the return of White Walker by Johnnie Walker, another limited-edition whisky in celebration of series, inspired by the most enigmatic and feared characters on Game of Thrones; the White Walkers. House Stark's resiliency, strength and ability to thrive under the most intense situations are greatly shaped by Winterfell's frigid temperatures. Dalwhinnie, known for being one of the highest distilleries in all of Scotland is cold and remote much like The North where House Stark calls home, making the two an iconic pairing. Extreme conditions are responsible for shaping the signature Dalwhinnie Winter's Frost honeyed sweetness and spicy warmth. Naturally, it's best served chilled or over ice. TASTE: Orange and clove open on the nose but on the palate there's red berry compote and vanilla cheesecake with a pronounced cereal spice finish. Lagavulin is one of the most legendary single malt brands and has been crafted on the shores of Islay for more than 200 years – mirroring the meticulous calculation and tenacity employed by the Lannister's in their rise to conquer the Iron Throne. This single malt whisky is a roaring single malt that recalls the Lannister's riches and is best served neat or with a single drop of water.